For the purposes of this truck comparison, we will be looking at the all-new 2019 Chevy Silverado 1500 LTZ and the Ford F-150 Lariat. The all-new Silverado 1500 LTZ has a starting MSRP of $43,000 and the Ford F-150 Lariat has a starting MSRP of $41,700. Would you like to learn more about the all-new Silverado 1500? Then check out our all-new Silverado 1500 trims page or see our inventory. If you’re already smitten with the all-new Silverado 1500, you can always schedule a test drive at our Libertyville, IL, location. If you have any further questions, call us at (847) 892-1530 or contact us online. Both the all-new Silverado 1500 and the Ford F-150 have proven performance and tough capability, but which light duty pickup truck has the specs you need to make your long hauls and short trips? The all-new Chevy Silverado 1500 provides impressive specs with its 5.3L EcoTec3 V8 with Dynamic Fuel Management engine, leaving the Ford F-150 in the dust with its 2.7L EcoBoost® V6. Have a look at the table below to see the engines head-to-head. 383 lb.-ft. Torque 400 lb.-ft. The all-new Silverado 1500 LTZ blows the 2019 Ford F-150 Lariat out of the water with its towing capacity of 11,100 lbs. when properly equipped using the LTZ’s standard engine. By comparison, Ford F-150’s Lariat has a maximum towing capacity of 8,500 lbs. So if hauling heavy trailers is your jam, the all-new Silverado 1500 is clearly the better option. Are you seeking premium comforts with maximum storage space? Then look no further than the all-new Silverado 1500. The 2019 LTZ model comes with three cab and bed configurations, which are listed below. The 2019 F-150 has some similar technology features to the all-new Silverado 1500, such as cruise control and FordPass™ Connect with WiFi® hotspot. The all-new Silverado 1500 also has cruise control and comes with a 4G LTE Wi-Fi® hotspot. 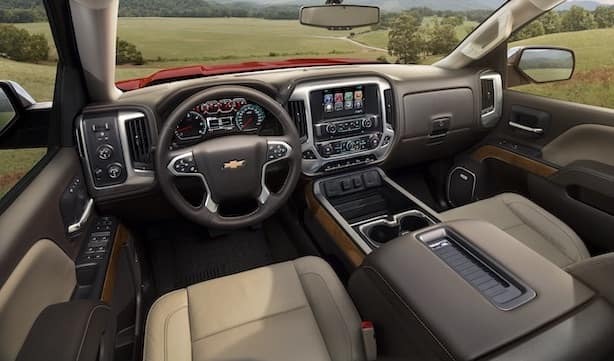 Our experts believe that the all-new Silverado 1500 has overall better technology features that are more user-friendly. Listed below are just a few of the all-new Silverado 1500 technology options. Schedule A Test Drive at Libertyville Chevrolet Today!